Municipal and district judges should be allowed to reduce fines for defendants who are unable to pay the mandatory minimum. 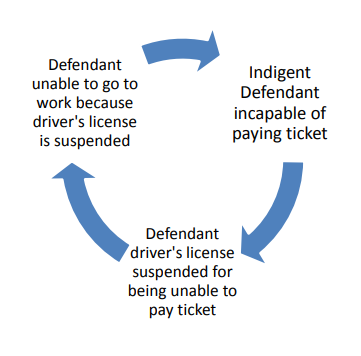 Before suspending a driver’s license for nonpayment of fines and fees, courts should hold an ability to pay hearing. Judges should be able to allow defendants to do community service to satisfy their outstanding debt. Reinstatement fees should be reduced or waived depending on the defendant’s ability to pay. To determine ability to pay, defendants should fill out an “affidavit of indigency,” or a form that explains their finances to the court. Courts should implement procedural protections (i.e. an ability to pay hearing and other due process protections) before revoking probation or parole due to nonpayment of fines and fees. The state of Kansas should “compile and distribute” information for municipal judges about the techniques that municipalities use to collect fines and fees, including payment plans and collections systems.